Wahama junior Alexis Mick belts out a pinch-hit single in the sixth inning of Tuesday night’s Class A Region IV, Section 1 softball championship game against Calhoun County in Hartford, W.Va.
HARTFORD, W.Va. — Home wasn’t where the heart was. 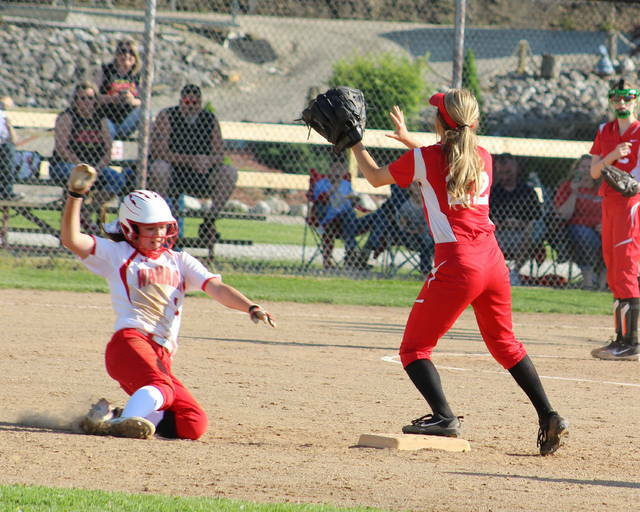 The top-seeded Wahama softball team had a memorable 2018 campaign come to an emphatic halt on Tuesday night after dropping an 8-4 decision to visiting Calhoun County in the Class A Region IV, Section 1 championship final held in Mason County. 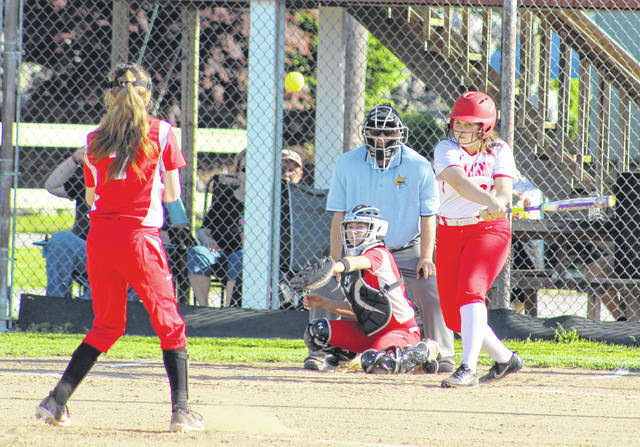 The host Lady Falcons (19-12) built a 2-1 edge through one complete, but the fifth-seeded Lady Red Devils (9-13) rallied with five consecutive runs over their next five innings at the plate while building a 6-2 cushion. Wahama countered with two runs in the home half of the sixth and built some momentum by cutting the deficit down to two scores headed into the finale, but CCHS responded with a two-run homer off the bat of Alison Dennis in the seventh — doubling the lead back out to four runs. 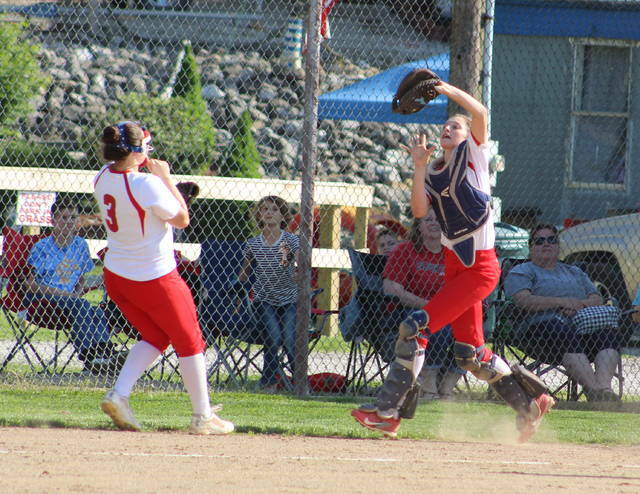 The Lady Falcons had runners at first and third with two away in the bottom of the seventh, but a first-pitch pop up to third ended the rally bid — as well as Wahama’s season. 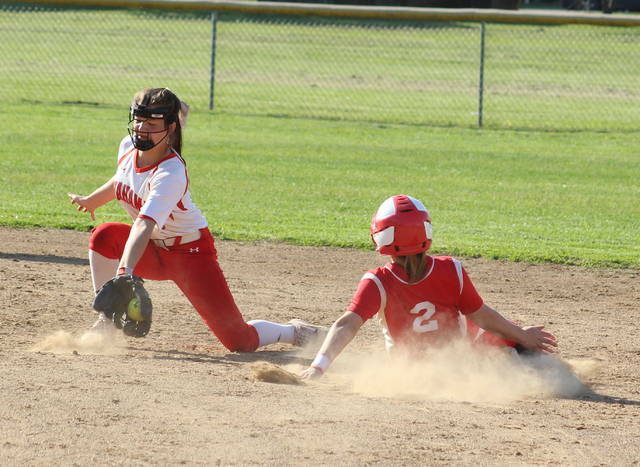 Wahama had its four-game winning streak snapped a day after forcing a second championship game with a 14-2 victory over the Lady Red Devils in Calhoun County. The difference this time around, however, came in the field as the Lady Falcons committed six errors in the setback. The guests, conversely, committed four miscues in the triumph. Afterwards, WHS coach Mike Wolfe was disappointed in the outcome — primarily because his troops didn’t put forth their best effort. 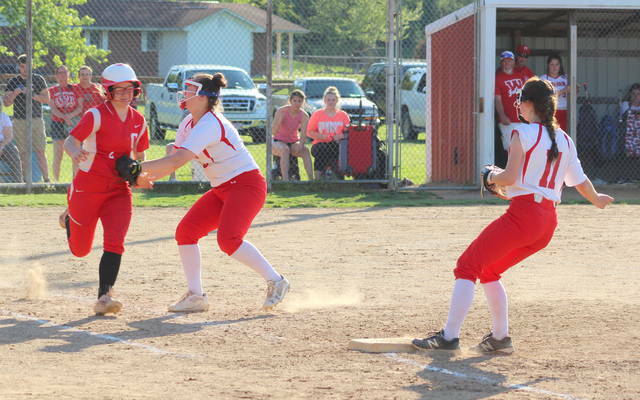 Wahama opened tournament play with a 12-11 home loss to Wirt County before reeling off four straight wins, returning home-field advantage to the Lady Falcons in the Region IV, Section 1 finale. And early on, it appeared that the playing at home would prove to be an advantage. CCHS built a 1-0 lead in the top of the first as Madison Dennis scored on a groundout by Brogan Richards three batter into the frame, but the hosts countered with a pair of runs in their half of the first. Hannah Rose led things off with a single and later scored on a one-out triple off the bat of Emily VanMatre. VanMatre later came plateward on a two-out single by Ashtyn Russell down the left field line, giving WHS its only lead of the game at 2-1. Calhoun County, however, took the lead permanently in the top of the second as Madison Dennis delivered a two-out triple to right-center that allowed both Brandee Allen and Tori Carpenter to come home for a 3-2 advantage. After a pair of scoreless third and fourth frames, CCHS went back to work in the fifth as Richards started the inning by reaching on an error. Haley Wilson followed with a one-out triple to left-center that plated Richards for a 4-2 contest. Katie Jones followed with a ground out that allowed Wilson to come home for a 5-2 edge midway through the fifth. Madison Dennis produced a one-out single in the sixth, stole second and eventually came around to score on a two-base error that put Megan Jones at second while establishing a 6-2 lead. Wahama put together one final rally in the home half of the sixth as Victoria VanMatre singled with one out, then Logan Eades entered as a pinch-runner and advanced to second on a Hannah Billups single. Pinch-hitter Alexis Mick hit a high chopper to shortstop with two away, but the throw was offline and ended up reaching the side fencing in foul territory — allowing both Eades and Billups to score while cutting the deficit down to 6-4. Wilson led off the top of the seventh by reaching second on a two-base error, then Alison Dennis lofted a long fly ball over the left-center field fence with one away — increasing the Lady Red Devils lead out to 8-4. Wahama outhit the guests by a 10-9 overall margin and also stranded nine runners on base, while CCHS left eight on the bags. Tori Carpenter was the winning pitcher of record after allowing two earned runs and 10 hits over seven innings while striking out two. Hannah Rose took the loss after surrendering four earned runs, nine hits and one walk over seven frames while fanning three. Rose led the hosts with three hits, followed by Emily VanMatre and Victoria VanMatre with two safeties apiece. Russell, Billups and Autumn Baker also had a hit apiece in the season-ending setback. Russell and Emily VanMatre each drove in a run, while Rose, Eades, Billups and Emily VanMatre scored a run apiece. Allen, Madison Dennis and Alison Dennis paced CCHS with two hits apiece, followed by Wilson, Carpenter and Whitney Stevens with a hit each. The Dennis sisters accounted for two RBIs apiece, while Wilson and Madison Dennis each scored twice for the victors. After missing out on regionals for the second consecutive postseason, the Lady Falcons also came up just short in defending their share of the 2017 TVC Hocking crown as the Red and White will finish no worse than tied for second place in the final standings. Wahama — which is currently 12-3 in league play — has a makeup game left with Miller, but that contest might not be made up due to WVSSAC rules. Once a team is eliminated from the West Virginia postseason, that program’s season is supposed to be finished. In some regards, it’s a tough way to see a promising season come to an end. Then again, with only one senior on this squad, Wolfe believes great things are on the horizon for these Lady Falcons.